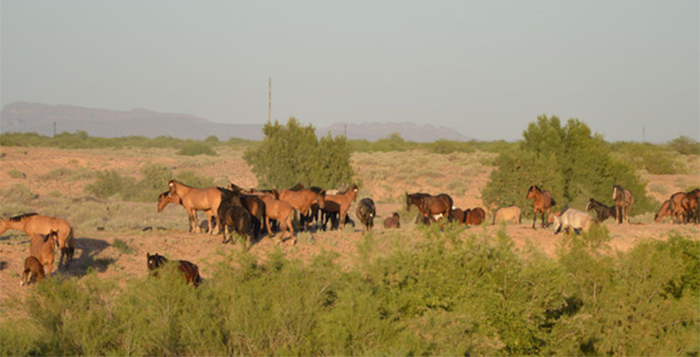 Maricopa's wild horse herd remains a popular sight along State Route 347. Cell phones, laptops, the Internet…the world is transforming into a place in which everyone is connected one way or another through a complex series of wires, signals and telephone lines. However, neighboring the city of Maricopa, spread across 372,000 acres of land, you’ll find 600 to 1,000 horses running wild and free. These majestic animals survive, as they have for decades, living off the land and fighting for dominance, living on their own terms. If only people could truly disconnect themselves and live so free. “The horses do what they want; they have no master; they are what freedom used to be,” said Emmet White. The 72-year-old White is a Pima, referred to as “a cowboy” by many of his peers. White has many stories about his interaction with the horses and growing up in the Indian community, but this tale begins before White or the wild horses set foot on the land. To understand how the horses came to live on the land, it’s helpful to get some historical perspective. Jesuit missionary Father Eusebio Francisco Kino first visited the Pima and Maricopa people living along the Gila River in 1694. He and other explorers to the area described the tribes as friendly, living in a series of villages located generally between where the modern communities of Sacaton and Gila Crossing lie today. Their economy was based on agriculture, using the land adjacent to the Gila River to cultivate beans, corn, pumpkins, watermelons, muskmelons and cotton. However, it wasn’t the descriptions, which would impact the Indians’ culture, that these explorers, missionaries and others brought back to the civilized world: it was the animals. Prior to the arrival of the Spaniards, the Indian communities relied essentially on their hands to complete day-to-day tasks. Yet, many of the people who came through the area left behind horses and other animals that became entrenched in the lifestyle of the community, said Robert Johnson, a 51-year-old member of the tribe and cultural educator at the Huhugam Heritage Center. “The horses, donkeys and other animals became a way of improving agriculture in the area, and a further means for the tribe to protect itself from the Apache,” Johnson said. Those frequent travelers who left behind sick and tired animals were not only exploring Spaniards, but also 49ers, who passed through in route to California to search for gold. In the spring of 1849, many of these gold hunters, an estimated 25,000 to 40,000, took one of the northern routes up the Platte River Valley and through the South Pass in Wyoming. They made their way to Salt Lake City and then across Nevada, more than 2,000 miles across mostly unsettled country. However, another 9,000 to 20,000 travelers took one of the southern routes, which included the Gila Trail and Cooke’s Wagon Road, as well as other trails across northern Mexico. Most of the southern trails came together at the Gila, where travelers left wounded or exhausted animals that the tribes adopted and nursed back to health. A then 12-year-old White and several of his friends crept quietly toward a group of horses. It had long been a sort of ritual of passage among the many members of the tribe to rope and ride the horses in the herd, and White was not one to back down. He lassoed a horse and pulled himself up on its back. While riding the horses was part sport, it was also a mode of transportation for the young Pima. “When I grew up it was either walk or find a horse to ride,” White said. For many years, White rode horses in the herd and only gave up the hobby as he became older. However, experiences with the herd were not reserved for tribal members. Former city councilman Brent Murphree’s family managed nearly 1,000 acres of farmland, which bordered the Indian community, when he was growing up. “Many people say those were the good ole days, but if you look how we lived back then compared to today, life was really a lot more difficult,” he said. Some of those difficulties revolved around the herd. Several times a year, the horses would get into the family’s acreage and eat the crops. “They would break the stalks and make it difficult to harvest,” he said. However, the Murphree family had a solution—dirt bikes. When the horses came into the fields, Murphree and his brothers would mount up on their dirt bikes and chase the horses off the land. In addition to the trouble they caused in the field, the herd used to wander onto State Route 347. “I remember the year before they put the fence up, nine horses were killed; it was very dangerous to drive down that road,” Murphree said. Today, the horses have become somewhat of a symbol of a time past and are not an everyday part of tribal life. “Every family used to have a horse for work or transportation, but those days are long gone,” Johnson said. The tribe does not actively manage the herd, but does operate a solar-operated well to help keep the horses hydrated, according to Cliff Targowski of the Gila River Indian Community’s natural resources conservation department. At one time, the tribe would round up the horses and auction them off, but due to financial reasons, that practice has stopped. While the herd continues to inspire a sense of the romantic West in passersby, Johnson said it can still be a nuisance. The stallions will oftentimes find domesticated mares on the ranches in the community and draw them away into the pack, Johnson said. In some cases, it takes the families three months to track down their horses, he added. “A lot of the cowboys just chase the horses away when they come near a settlement,” Johnson said. Wild horses, or mustangs as they are known, are no different from many pack animals and have distinct markings and behavioral patterns. “The horses live in herds of typically one breeding stallion, one to 12 breeding mares, their nursing foals and weaned colts and fillies,” said Bobbi Royal, the director and co-founder of Nevada-based Wild Horse Spirit, a hands-on, non-profit wild horse rescue, sanctuary and advocacy organization. Once the weaned fillies and colts reach the age of three, they are typically driven from the herd to prevent inbreeding by the dominant stallion. These then go on to establish herds of their own. “Horses are very attached to their mothers and don’t want to leave the herd,” Royal said. “The stallions give them no choice though.” Those males that don’t find any females to join their pack will often form bachelor herds, she added. Along the Gila River, there are essentially four larger herds, consisting of 25 or more head and many other groups of two to three, according to Johnson. The stallion in the herd serves as the protector of the group and will stay and battle if danger approaches, while the group also features a lead mare that navigates the group to safety. A combination of time in the herd, size and temperament determines the pecking order in the herd. While a herd will stay together for many years, each breeding season brings about opportunity for change. During this season the stallion of the herd will aggressively drive back any mares who try to leave the group by laying his ears back and twisting his head and neck in a snaking motion. Stallions will also battle for control of the herd in this same manner, in addition to nipping and rearing up with their hooves. If a stallion is displaced from a herd, they typically go on to join a bachelor herd. While characteristics of life in the herd are amazing to observe, Royal says it’s the toughness of the horses at which one marvels. “These horses will eat almost anything and travel more than 30 miles to find water,” she said. White said he has seen the horses even dig in the ground to find water. “It is amazing; it is like they know exactly where the water is,” he said. And the horses aren’t too particular about their diet, even eating tumbleweeds and branches. But two of the lesser-known facts about these animals are their digestive system and ability to prevent wild fires, Royal said. • The Gila Butte herd roams east of Interstate 10 between Gila Butte and Goodyear Village and can be observed on any given day. • The Pima Butte herd roams between Pima Butte and just east of I-10. They cross back and forth under State Route 347 at the Gila River Bridge and are usually spotted along SR 347. • The Estrella herd roams mostly in the scrub-mesquite growth along Santa Cruz Wash and the Estrella Range. This herd can be seen only sporadically along Beltline Road; it is the largest of the three packs never coming in contact with humans. If the herd is spotted, it’s usually taking water from the irrigation canals. They raise a dust cloud when in motion.